The aim of the present study was to characterize the activation profiles of 15 opioid ligands in transfected human embryonic kidney cells expressing only δ opioid receptors. Activation profiles of most of these ligands at δ opioid receptors had not been previously characterized in vitro. Receptor activation was assessed by measuring the inhibition of forskolin-stimulated cAMP production. Naltrexone and nalorphine were classified as antagonists at δ opioid receptor. The other ligands studied were agonists at δ opioid receptors and demonstrated IC50 values of 0.1 nM to 2 μM, maximal inhibition of 39–77% and receptor binding affinities of 0.5 to 243 nM. The rank order of efficacy of the ligands tested was metazocine = xorphanol ≥ fentanyl = SKF 10047 = etorphine = hydromorphone = butorphanol = lofentanil > WIN 44,441 = Nalbuphine = cyclazocine ≥ met-enkephalin >> morphine = dezocine. For the first time these data describe and compare the function and relative efficacy of several ligands at δ opioid receptors. The data produced from this study can lead to elucidation of the complete activation profiles of several opioid ligands, leading to clarification of the mechanisms involved in physiological effects of these ligands at δ opioid receptors. Furthermore, these data can be used as a basis for novel use of existing opioid ligands based on their pharmacology at δ opioid receptors. Opioid receptors belong to the large superfamily of G protein coupled receptors . Three major types of opioid receptors (μ, δ and κ) have been cloned and each one is associated with several physiological and behavioural roles. The focus of the present work is the δ opioid receptor. Delta opioid receptors play a modulatory role in analgesia, hibernation, autonomic nervous system function, neuroendocrine system function, mood driven behaviours and olfaction . Thus, understanding the requirements for activation of δ opioid receptors can lead to identification and design of novel drugs acting through this receptor for treatment of various physiological problems. While designing drugs with selectivity to a single receptor can be a desirable approach in drug design, another approach may be to design drugs that act on more than one receptor, but with differential activity on each receptor. These would be drugs that act as an agonist at one receptor and as an antagonist or partial agonist at another receptor type. The latter approach would be useful in situations where the same receptor type that mediates the beneficial effect of the drug also mediates the untoward effect . In this case interaction with another receptor type could reverse the unwanted effects associated with the activation of the first receptor. In the absence of comprehensive activation data for opioid ligands at δ opioid receptors, we set out to characterize a set of fifteen opioid ligands for their activity in cells expressing only δ opioid receptors. These ligands were selected based on our previous data showing that they bound all three opioid receptors . However, model tissue studies  and in vivo studies  had suggested that these ligands exhibited differential activation profiles at the three opioid receptors. Thus the present study was designed, (1) to describe the activation profiles of a set of opioid ligands not previously defined at an isolated cell system expressing only δ opioid receptors, and (2) to compare the relative efficacies and potencies of these ligands to the strongest ligand in the set, metazocine, to the common opioid analgesic, morphine and to the endogenous δ opioid ligand, met-enkephalin. In this study, the activity of δ opioid receptor was measured by assessing the levels of inhibition of forskolin-stimulated cAMP production in the presence of various opioid ligands. It has been reported that δ opioid receptors couple more efficiently to adenylyl cyclase system than to Ca2+ channels . This evidence supports the use of cAMP system for assessing the activity of these receptors. Moreover, cAMP has been implicated in playing a role in the analgesic effects mediated through δ opioid receptors [8, 9]. Human embryonic kidney cells stably expressing mouse δ opioid receptors were used to characterize the activation profiles of opioid ligands in this study. The results describe the activity of a set of ligands not previously characterized at δ opioid receptors. The results obtained from this study will serve to define the relative efficacies and potencies of a set of opioid ligands compared to one another and differentiate between the full and partial agonists at δ opioid receptors. All ligands used (Table 1) were non-peptide ligands selected for lack of selectivity for different opioid receptors. In the majority of cases the data were reproducible and inter-experimental variability was small (Figure 1). Thus the data from several experiments were normalized to the top of the fitted curve (no ligand, forskolin alone), the results of several experiments pooled and a new fitted curve constructed (Figure 2). The IC50 values in Table 1 are the results of the pooled normalized data from 3 or more experiments carried out in duplicate. 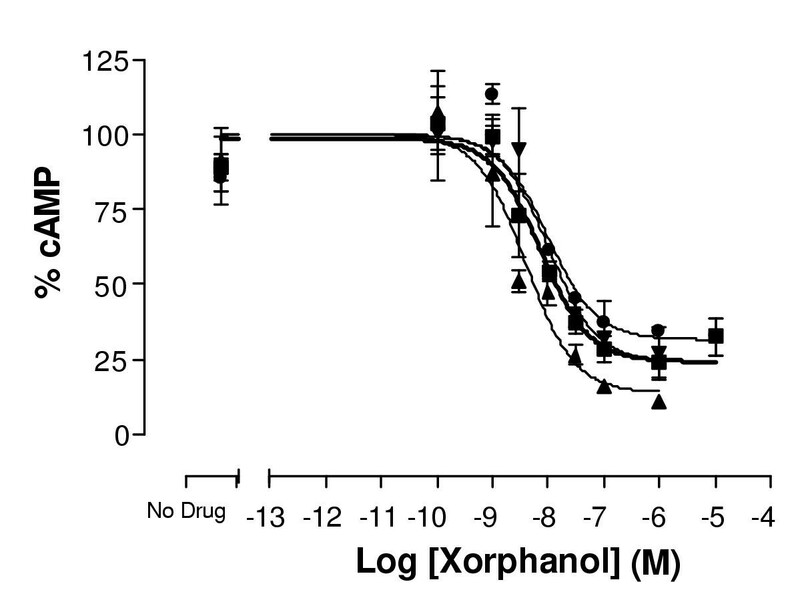 Reproducibility of dose response curves for xorphanol at δ opioid receptors. This graph represents inter-experimental variability for dose response curves. Three independent experiments were carried out in duplicate. Varying concentrations of xorphanol were used to determine the potency and efficacy of xorphanol in inhibiting the effect of 5 μM forskolin in producing cAMP, as described under methods. Maximal cAMP levels were in the range of 400–1000 pmole/well. Data have been normalized as described under methods. Error bars represent standard error of the mean of duplicate measurements for each point. Dose response curves of representative ligands on δ opioid receptors Varying concentrations of opioid ligands were used to determine the potency and efficacy of each ligand in inhibiting the effect of 5 μM forskolin in producing cAMP, as described under methods. Maximal cAMP levels were in the range of 400–1000 pmole/well. Data presented are the average data from 2 or more experiments carried out in duplicate. Data have been normalized as described under methods. Error bars represent standard error of the mean of the normalized data. (■) Etorphine, (□) Lofentanil, (▼) SKF 10047 and (●) Fentanyl. Inhibitory effect of opioid ligands on Forskolin-stimulated Adenylyl Cyclase activity was measured as described under Materials and Methods. Data for IC50's represent the mean ± SEM obtained from two or more experiments carried out in duplicate. Maximum inhibition is the mean ± SEM of maximum inhibition obtained from a best fit curve as described under "Materials and Methods" (** = P < 0.001, * = P < 0.05 compared to Metazocine), ($$ = P < 0.001, $ = P < 0.05 compared to morphine), (## = P < 0.001, # = P < 0.05 compared to met-enkephalin). Two ligands, nalbuphine and naltrexone were categorized as antagonists. All other ligands studied showed a robust inhibitory effect on the forskolin stimulated cAMP production (Table 1). The rank order of efficacy of the ligands tested was metazocine = xorphanol ≥ fentanyl = SKF 10047 = etorphine = hydromorphone = butorphanol = lofentanil > WIN 44,441 = Nalbuphine = cyclazocine ≥ met-enkephalin >> morphine = dezocine. Statistical analysis showed that most of the agonists tested had efficacies that were not significantly different from that of the endogenous ligand met-enkephalin. The only exceptions were the highly efficacious ligands fentanyl (P < 0.05), metazocine (P < 0.001) and xorphanol (p < 0.001). The potencies for the different ligands ranged from 0.2 – 2039 nM. The most potent ligands studied, as measured by the lowest IC50 values (Table 1), were etorphine, cyclazocine, lofentanil, and xorphanol with IC50's of less than 10 nM. The other ligands, met-enkephalin, WIN 44,441, hydromorphone and Butorphanol, exhibited potencies of 10–100 nM; metazocine and SKF 10047, 100–200 nM, and nalbuphine, dezocine and morphine, 400–1000 nM. The least potent ligand was fentanyl with an IC50 of about 2 μM. The rank order of potency of these ligands was; etorphine>lofentanil≥cyclazocine=xorphanol>met-enkephalin> Win 44,441=hydromorphone≥butorphanol>metazocine=SKF 10047> dezocine≥ nalbuphine>morphine>fentanyl. 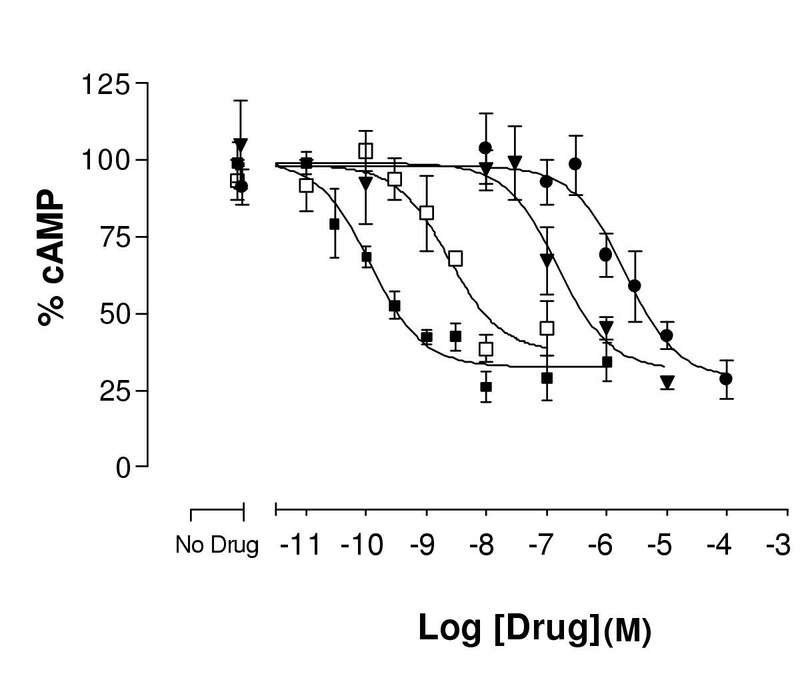 Figure 2 depicts dose-response curves of a representative set of ligands. Etorphine and lofentanil are shown as examples of two very efficacious and highly potent ligands. SKF 10047 is representative of a very efficacious ligand with intermediate potency. Finally, fentanyl is shown as an example of a ligand with very low potency, which is nevertheless very efficacious if high enough concentrations are used. Human embryonic kidney (HEK) cells were transfected to express mouse δ opioid receptors. These cells do not express any endogenous δ opioid receptors, as they lack binding of the radioactive tracer [3H]-DPDPE (data not shown), thus they serve as a good system for the expression of opioid receptors. A single clone of HEK cells, stably expressing 1925 ± 425 fmole/mg protein δ opioid receptors, was selected for this study. The Kd for [3H]-DPDPE in these cells was 0.65 ± 0.27 nM. These cells were used to characterize the activity of fifteen opioid ligands in inhibiting forskolin-stimulated cAMP production. Ligands that showed very low potencies or low enough efficacies to be tested for antagonistic effect were further characterized for their binding affinities at δ opioid receptors. All ligands studied exhibited Ki values in nanomolar range. The rank order of affinity of the ligands was xorphanol > Win 44,441> nalorphine > morphine ≥ nalbuphine > fentanyl (Table 2). The rank order of affinity agrees with the rank order of potency of these ligands in inhibiting forskolin-stimulated cAMP production. Competition binding assays were carried out in cell homogenates of HEK-δ cells as described under Methods. Data represent mean ± SEM. of Ki values from two or more independent experiments carried out in triplicate. Ligands acting at δ receptors can induce antinociception both spinally and supraspinally [10–12], thus identifying ligands that activate δ opioid receptors and determining their physiochemical characteristics is essential to understanding opioid receptor pharmacology and physiology. There is evidence suggesting that δ selective opioid ligands do not cause changes in respiratory parameters . Thus, suggesting that designing specific ligands that act at δ opioid receptors may be useful in formulating analgesics without the side effect of ventilatory depression. Yet, some selective δ ligands have been shown to be ineffective antinociceptive agents when given systemically [14–16]. The reason for this ineffectiveness is not clear. Still, other reports, have suggested that opioid ligands with agonistic effect at μ opioid receptors and antagonistic effect at δ opioid receptors are potentially useful analgesics [3, 17, 18]. These latter results advocate that the key to designing opioid ligands with optimal analgesia and minimal side effects may be in the design of ligands that act on more than one receptor type, but activate each receptor differently. Thus, it is useful to identify opioid ligands with differential activation profiles and characterize their physiological effects (analgesic and unwanted effects). Prior to the design of any novel drugs based on this approach, it is necessary to clearly understand how the known nonselective opioid ligands act at δ opioid receptors. Such information can not only help explain some of the paradoxical behavioural data of these ligands, but it can also explain the interaction of each ligand with a single receptor involved in modulation of the pain pathways. The present data serve to define the mode of action of a set of opioid ligands at δ opioid receptors and will help explain the physiological effect of these ligands. Moreover, since δ opioid receptors have been reported to exert a physiology indicative of regulatory effects on hemodynamic balance and cardiac function as well as hibernation, a better understanding of δ receptor pharmacology can lead to possible novel uses of δ ligands independent of analgesia. The present study was designed as one of the steps in defining the detailed pharmacology of a set of non-selective opioid ligands and aimed at defining the activation profiles of these ligands at a well-defined system expressing only δ opioid receptors. The use of such a system is essential for understanding the mode of action of ligands at a specific receptor. Such data can then be used to interpret the findings from more complex settings, such as in vivo studies, where multiple opioid receptor types are expressed. The data presented in this report agree with available published data, thus establishing that the methods used were valid and could be successfully used to provide useful data for previously uncharacterised ligands. For example, as reported, etorphine  and lofentanil  were shown to be highly potent and efficacious at δ opioid receptors. Comparison of the efficacies of the set of agonists in this study to that of the endogenous ligand, met-enkephalin, showed that all were full agonists. Moreover, fentanyl, metazocine and xorphanol could be considered "super agonists" at delta receptors based on having efficacies significantly greater than met-enkephalin. This observation suggests that in situations where the endogenous ligand is present (such as in a stressed animal), it is possible to achieve further activation of δ opioid receptors by the application of one of these ligands. Moreover, the efficacies of the above "super agonists" were comparable to that of δ selective ligands such as SNC80 and BW373U86. Based on previous reports, maximum inhibitory effect of SNC-80 in transfected δ opioid receptors is 71 ± 5%  and 94 ± 2%  with IC50 values of 15 and 6.3 nM respectively. The maximum effect of BW373U86 has been reported to be 70 ± 9% with IC50 of 0.9 nM . Some ligands that exhibited very low potencies in this study, such as fentanyl or metazocine, were amongst the most efficacious ligands tested suggesting that these ligands are capable of maximally activating δ opioid receptors. Thus, different concentrations of these ligands can be used to achieve various physiological effects based on the pharmacological properties of these ligands on other opioid receptors. Fentanyl is a synthetic opioid ligand belonging to the phenylpiperidine family of ligands. Based on receptor binding assays, fentanyl has an affinity for μ opioid receptors, that is 100–1000 fold higher than that for δ opioid receptors [23, 24]. However, no published activation data for fentanyl at δ opioid receptors was available. In vivo, fentanyl is a strong analgesic agent in pharmacological doses due to its interaction with μ opioid receptors . However, at higher toxic doses it shows general opioid toxicity symptoms in addition to muscular rigidity, which are reversible by naloxone. Muscular rigidity of fentanyl has been suggested to occur via several mechanism involving glutamatergic pathways , serotonergic system  as well as noradrenergic system [27, 28]. One other potential pathway may be via regulation of dopaminergic system as suggested before  possibly via δ opioid receptor system as explained here. It has been reported that stimulation of δ opioid receptors can cause inhibition of dopamine release in striatal pathways, resulting in muscular rigidity . The present report shows that although fentanyl has low affinity and low potency at δ opioid receptor, it is highly efficacious at these receptors. Thus, at high fentanyl concentrations δ opioid receptors can also be fully activated possibly leading to the inhibition of dopamine release and the resultant muscle rigidity. So the data presented can serve to describe the mechanism of action and physiological observations after application of drugs in vivo. Based on the present data, a distinct effect of morphine compared to fentanyl can be observed at δ opioid receptors. While fentanyl is a full agonist at δ opioid receptors, morphine is only a partial agonist. Thus, although both these drugs can activate δ opioid receptors with low potency, at high concentrations morphine cannot stimulate δ receptor as effectively as fentanyl. Thus, fentanyl, but not morphine, can elicit physiological changes that are mediated by activation of δ opioid receptors. A different scenario holds true for the two ligands, xorphanol and WIN 44,441. Both these ligands have high affinities and potencies at δ opioid receptors with xorphanol being very efficacious at δ opioid receptors. At μ opioid receptors, however, the activation profiles of these ligands are different. While both these ligands bind with high affinities (less than 1 nM) to μ opioid receptors, WIN 44,441 acts as an antagonist at μ opioid receptors and xorphanol is a very weak agonist at μ opioid receptor (Gharagozlou et al. unpublished results). Thus these ligands can be useful in clinical applications where activation of δ opioid receptors needs to be combined with a weak action or an antagonistic action at μ opioid receptors. Such an application can be very important due to the unique physiology of δ opioid receptors. Studies such as presented here can serve to provide the data necessary for application of opioid ligands in such unique settings. Moreover, until now the activity of xorphanol at δ opioid receptors had not been described. This ligand had been described as a mixed agonist-antagonist opioid ligand [30, 31] with agonistic activity at κ opioid receptors . Overall very little work has been done on xorphanol and little is known about it except that it is an orally active analgesic with limited physical dependence liability . Thus the present report describing its activity at δ opioid receptors provides useful data on this ligand. Nalorphine, has been previously categorized as a "mixed agonist/antagonist" ligand . These are ligands that are believed to act as an agonist at κ and as an antagonist at μ opioid receptors. No published in vitro data was available for the activation profile of this ligand at δ opioid receptors. In this study nalorphine was shown to be an antagonist at δ opioid receptor with a moderate binding affinity. Such a moderate affinity makes it possible for nalorphine to antagonize the effect of other ligands or the endogenous ligand (like met-enkephalin) at δ opioid receptors while possibly acting as an agonist at other opioid receptors. Based on the regulatory role of δ opioid receptors such applications may be numerous. Data similar to the one presented in this report, will open the door for novel applications of these ligands in the treatment of various ailments. The present study was designed to characterize the activation profiles of a set of opioid ligands in cells expressing only δ opioid receptors. These ligands had not been previously characterized at δ opioid receptors. The data produced from this study can be used to achieve several goals. (1) These data can lead to elucidation of the complete activation profiles of these ligands, leading to clarification of the mechanisms involved in physiological effects of these ligands at δ opioid receptor. (2) These data can be used as a basis for novel use of existing opioid ligands based on their pharmacology at δ opioid receptors. (3) These in vitro data can be utilized to define the physiochemical features of the ligands defining agonism and antagonism at δ opioid receptors, leading to design and discovery of novel opioid analgesics. (4) In combination with in vivo data characterizing analgesic and unwanted effects of these ligands, the in vitro data can be used to identify the activation profile of the ideal opioid analgesic that has minimal side effects. Such information, combined with the knowledge on the physiochemical characteristics of the agonists and antagonists at each receptor, will lead to the design of novel opioid analgesics with minimal side effects. Human Embryonic Kidney (HEK) 293 cells were maintained in D-MEM/F-12 (Dulbecco's Modified Eagle's Medium: Nutrient Mixture F-12 1:1 mixture), supplemented with 10% (v/v) fetal calf serum (FCS), 200 μg/ml G-418 (Geneticin®) in a humidified incubator with 5% CO2 and 95% air, at 37°C. The incubation medium was changed every 3–4 days. Once a week, cells were re-plated at 20% density into 75-cm2 tissue culture flasks. Stably transfected HEK cells were developed as described previously . HEK 293 cells were transfected with the cDNA for mouse δ opioid receptor in the pCI-neo® vector. The mouse δ cDNA was obtained in the vector pCMV (a generous gift from Dr. Graham Bell, University of Chicago). The 1.2 kb coding sequence of the receptor was subcloned into pCI-neo® mammalian expression vector (Promega, Madison, WI) using the restriction sites EcoRI and Sal I. HEK 293 cell were transfected with the vector using the lipofectin® reagent (Life Technologies, Rockville, MD). Stable clones were selected using 400 μg/ml Geneticin®. Single clone were picked and tested for expression of δ opioid receptor by binding assay. One clone expressing 1925 ± 425 fmoles/mg protein, as assessed by [3H]-DPDPE binding, was propagated for use in this study. Saturation binding assays were carried out for [3H]-DPDPE in HEK cells as described previously . Crude cell homogenate (20–25 μg of per assay tube) was used and incubation was in 50 mM Tris HCl, pH 7.4 at room temperature for 2 hours. The assay was terminated by rapid filtration through Whatman GF/B filters using a FilterMate cell harvester (Packard Instruments) followed by three washes, 4 ml each, with ice cold buffer. Radioactivity retained on the filters was measured using Microscint 0 in a TopCount liquid scintillation counter (Packard Instruments). Competition binding assays were carried out in crude membrane homogenate of HEK-δ cells. Binding was carried out in 250 μl volume of 50 mM Tris HCl buffer, pH 7.4 in the presence of 0.5–1 nM [3H]-DPDPE and increasing concentrations (24–32 different concentrations) of unlabeled ligand. Incubation and binding were as described above. Binding data were analyzed using the Affinity Analysis Software as described before [34, 35]. For preparation of crude membrane homogenate, confluent cultures of HEK-δ cells were harvested using phosphate buffered saline. Following centrifugation at 700 ×g, the cell pellet was resuspended in ice-cold 50 mM Tris HCl buffer pH 7.4 at about 107cell/ml, and homogenized using a polytron at setting 6 for 10 seconds. The cell homogenate was stored in aliquots at -86°C until use. Protein content of the cell homogenate was determined using Bio-Rad protein assay reagent (Bio-Rad, Hercules, CA). Inhibition of Forskolin stimulated cyclic AMP (cAMP) production by exposure to increasing concentrations of agonists were evaluated in intact cells. Exponentially growing HEK-δ cells were harvested and resuspended in serum free DMEM/F12 medium. Cells were plated in 96 well microtiter plates at 5 × 104 cells/well in 100 μl volume. To each well, phosphodiesterase inhibitor 3-isobutyl-1-methylxanthine (IBMX) was added to a final concentration of 100 μM, followed by addition of agonists at different concentrations and incubation at 37°C. Following 15 minutes incubation, forskolin was added to each well to a final concentration of 5 μM followed by another incubation for 15 min at 37°C. The final reaction volume was 200 μl. The reaction was terminated by aspiration of the medium and addition of 200 μl lysis buffer from the Biotrak™ cAMP Enzyme Immunoassay kit from Amersham Pharmacia Biotech (Buckinghamshire, England). The rest of the assay followed the protocol provided with the kit. Actual amount of cAMP was determined for each sample in comparison to a standard curve of known amounts of cAMP provided in the cAMP kit, as described in the kit protocol. Agonistic activity of opioid ligands was assessed by measuring the inhibitory effect of the ligands on forskolin-stimulated cAMP accumulation. Data from each experiment were normalized to the top of the curve (no ligand, 100%), expressed as percent inhibition of forskolin-stimulated cAMP accumulation and were fit to a sigmoidal function by using one site competition function as described below. The efficacy of each ligand was defined as percent inhibition of forskolin stimulated cAMP production compared to no ligand levels (0% inhibition, 100% cAMP production). Compounds with very little in vitro agonistic activity (<20% inhibition of cAMP production) for which the dose response curves could not be fitted, were tested for antagonism. Antagonists were identified as ligands that were able to repeatedly block the inhibitory effect of 1 nM etorphine on forskolin stimulated cAMP production. In these assays, antagonist was added to the cells along with IBMX. After 15 minutes of incubation, the agonist was added and the cells were incubated with both ligands for an additional 10 minutes. After addition of forskolin, the cells were incubated for 15 additional minutes. The rest of the assay was as described above. The analysis of ligand activity was performed using PRISM software (GraphPad Software, Inc. San Diego, CA). A computer-generated "best fit" of non-linear regression data was used to provide estimate of IC50. Dose response data generated by cAMP enzyme immunoassay (EIA) system were fitted with the one site competition function. Data from each dose response curve were normalized to the top of the respective curve. The normalized data from multiple dose response curves were combined and a new dose response curve was fitted to the combined data and maximal inhibition was determined for the combined data. IC50 values presented are the mean ± SEM of IC50 values from 2–3 independent experiments. Forskolin, fentanyl, IBMX, hydromorphone, and naltrexone were obtained from Sigma-Aldrich (St. Louis, MO), nalbuphine and met-enkephalin were obtained from RBI (Natik, MA), cyclazocine, etorphine, metazocine, morphine, nalorphine, and SKF 10047 were obtained from National Institute of Drug Abuse (Bethesda, MD), lofentanil was obtained from Janssen Pharmaceutical Inc. (Titusville, NJ), Dezocine was obtained from Wyeth Laboratories (Philadelphia, PA), Win 444,441 was obtained from Sterling Winthrop Pharmaceutical and Xorphanol was obtained from Miles Inc. Pharmaceutical Division (West Haven, CT). All tissue culture reagents were purchased from Life Technologies (Rockville, MD). DPDPE was obtained from Peninsula Laboratories (San Carlos, CA), and [3H]-DPDPE was from Multiple Peptide Systems (San Diego, CA). All other reagents were of analytical grade from standard commercial sources. All ligands used were prepared as 10 mM stock solutions in water except WIN 44,441, which was 5 mM. All ligands were dissolved in distilled water except cyclazocine, dezocine, etorphine, which were dissolved in 100% ethanol. For the drugs dissolved in ethanol, the final concentration of ethanol was <0.01% which had no affect on the assays performed. Maximal inhibitory effect of each ligand was compared to the levels of maximal inhibition by met-enkephalin, metazocine and morphine using ANOVA analysis with Dunnett's multiple comparison as post test using PRISM software (GraphPad Software, Inc. San Diego, CA). Significant difference between the inhibitory effects of two ligands was determined whenever p < 0.05. The authors wish to thank Dr. Graham Bell for the cDNA for mouse δ opioid receptor, and Drs. M. Frances Davies and Timothy M. DeLorey for valuable discussions. This work was supported by NIH grant DA12539. PG carried out the bulk of the cAMP assays, data and statistical analysis and drafted the manuscript. HD carried out some of the initial experiments and data analysis work. JDC provided intellectual input and critical interpretation of the data. JL conceived of the study, participated in its design and coordination, carried out the binding assays and finalized the manuscript for publication.